If the school-aged kids you care for haven’t gone back to school yet they will be after Labor Day. To make mornings less stressful, wouldn’t it be great if the kids would help get ready for school? If you are tired of always having to rush in the morning and constantly having to tell the children what they have to get ready for school the I Can Do It! School Chart can help tremendously. Children thrive on praise and a little incentive goes a long way. This chart gives parents and nannies the tools to help raise more responsible, self- reliant kids. The I Can Do It! 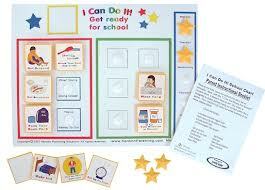 School Chart is designed to make getting ready for school seem like a game so the kids will have fun while learning to be more independent. Children simply moves their tasks from the red to the green as they complete them.When all their tasks are in the green they’re ready for school! It’s that simple. Then you can give them stars for that day. There are 10 different, colorful tasks to choose from on the chart. It has strong magnetic strips to hold it securely to any metal surface, like the refrigerator. The sturdy plastic stars and tasks attach easily with hook and loop circles. Colorful pictures aid young children in understanding the tasks and the chart can be customized to meet your specific needs.